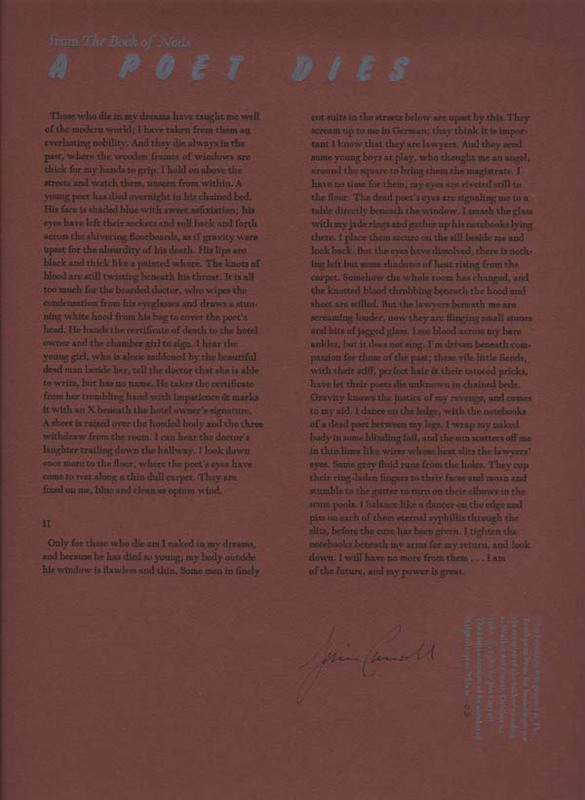 "A Poet Dies," later published in The Book of Nods (1986), and in Fear of Dreaming (1993), is one of 20 broadsides issued for the Walker Art Center Reading Series. All copies are printed on varying shades of Canson Mi-Tientes paper; "A Poet Dies" is on maroon-colored paper. There were 125 numbered and signed copies (the copy shown here appears to be #50), with 54 complete sets of the signed/numbered edition presented in a white Fabriano folder; the label on the cover is by Al Buck. There were also 26 complete sets, lettered and signed, presented in a grey fabric-covered box. Thanks to LaVerne Kreklau for contributing this image!